Chasing Smoke Ensemble. Courtesy of Brisbane Powerhouse Website. Chasing Smoke is a powerfully involving modern circus performance currently touring in Brisbane with a run at the Powerhouse from 24 October to 3 November 2018. 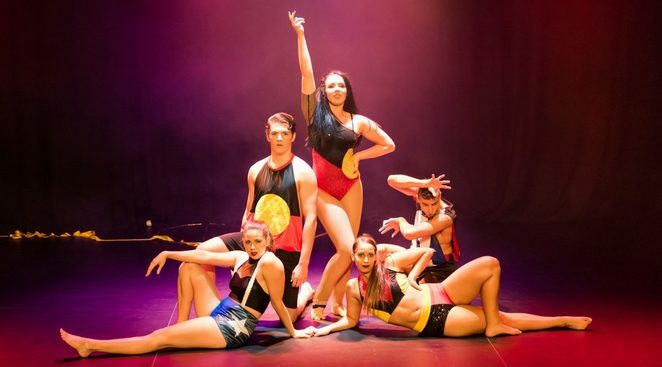 Presented by Casus Circus and Cluster Arts in partnership with Brisbane Powerhouse, Chasing Smoke features an all indigenous contemporary circus ensemble made possible by Circus Oz BLAKflip program. It can be limiting to think that only certain stories can be told by certain people but there is something powerfully heartfelt and raw in the stories told by this ensemble that feels like it could have only come from their voices. There are a variety of themes and tales touched upon over the hour-long show, amongst them colonialisation, the stolen generation, the Dreaming, mixed ethnicity and modern sensibilities. It's true on opening night there were a couple of mistakes, the performers taking it in their stride and keeping the show on track. In the small intimacy of the Visy Theatre, the production numbers were smaller and less elaborate than say the gold standard of Circa. Yet there was also a vulnerability and immediacy to the physicality of the performers throwing their bodies against the ground and each other that made it less impressive but more visceral. Stories were relayed in the first person over the speakers while the artists moved evocatively on stage. Hearing what it feels like for an individual affected by history and hopeful for the future brings a tear to the eye and creates the strongest sense of empathy that a thousand protest songs or history books may never have achieved. In that sense, this is art of the highest order – stirring and with something to say. Yet there is playfulness in the show, the most damning condemnation delivered with gallows humour or satire. The way mood and pacing is structured in the play is interesting with a perfect accompanying soundtrack. The most up-tempo piece, an impressive dance-off with the riskiest tricks comes several minutes before the performance concludes followed by a slow number suggesting the director wanted us to sit back and reflect. This is before closing the show with an upbeat and inclusive invitation to come together. This is a night at the theatre that touches the heart and lifts the soul. Thank you Amanda, I highly recommend it.